One of the most exciting things about the 2002 film "Minority Report" was the user interface design. Tom Cruise's character, John Anderton, uses gloves and gestures to interact with a computer. Robert Downey Jr. does the same thing as Tony Stark in the "Iron Man" and "Avengers" movies. Viewers are not only intrigued by these UI concepts, but they want such experiences for themselves. The technology is already here and becoming widespread. It is just a matter of time until it starts becoming commonplace and reaching consumers in multiple applications. User interface design has grown from screen-only to screen-first, incorporating voice and 3-D, in just a few years. Historically, UI and user experience design was constrained by hardware, but voice and 3-D can greatly expand the way people interact with computers and software. 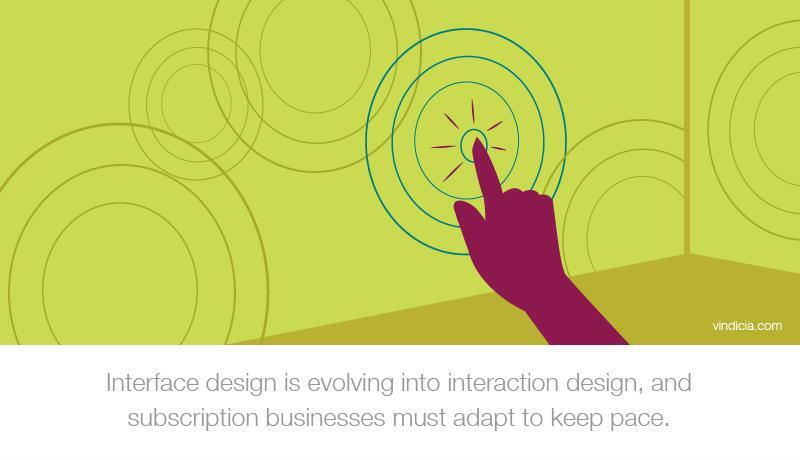 Subscription businesses should anticipate how interface design is slowly evolving to interaction design, and then evaluate how such interface elements can be used to increase subscriber satisfaction and reduce churn. Incorporating new UI technology creates a better experience for customers. Using voice commands for user interaction has existed as a concept for some time – think tools like Siri, Alexa and Cortana. Voice is great from both innovative and accessibility perspectives. It makes interactions simpler and faster, and it removes the need for a keyboard or other non-intuitive input device. It also allows individuals with impairments affecting touch and type input to benefit from apps and services that perhaps were previously inaccessible. Additionally, an increasing number of people use voice commands to make purchases. According to tech marketing and PR firm Walker Sands Communications' "Future of Retail" report, 19 percent of consumers made a voice-controlled purchase between 2016 to 2017, and another 33 percent are expected to do so by the end of 2018. "The walls between channels will continue to fall as voice-controlled and connected home devices reach widespread adoption and the commerce experience becomes fluid," Erin Jordan, lead of retail technology and account director at Walker Sands, said in the firm's press release. "Brands and retailers need to understand the always-on nature of consumers and identify the best way to add value through a consistent experience." "19% of consumers made a voice-controlled purchase between 2016 to 2017." That said, many voice UI features are currently limited in scope. For example, users of Apple's Siri only have so much functionality available before they must switch to typing or tapping the screen. They must activate Siri with a button press, speak to the device to enter their search query, then tap again to select from Siri's available responses. Furthermore, many mobile applications that incorporate a microphone require another physical interaction before launching the voice service. For instance, iPhone users often have to open the keyboard to use voice UI – a feature only available if text can be input. Even then, the microphone itself only transcribes the person's speech; the user must continue tapping the device to make their selection. Given that Walker Sands expects the number of consumers using voice UI to increase, subscription-based businesses should consider how and when they can integrate this type of design into their subscription billing, onboarding and customer service infrastructure. Doing so can help them meet usability expectations, thereby satisfying customers and reducing churn. For example, a user could speak to Alexa in order to download a new video app. Upon launch, the app will "talk" the user through the onboarding process, during which the man or woman will verbally input his or her name, address, email, billing details and other pertinent information. Laptops and headphones have microphones as well, opening voice UI to companies that provide software as a service and other programs that operate best on computers. IoT devices can also be constructed with microphones built in for greater accessibility. Regardless, subscription businesses should make sure any voice UI system they implement has a method of audio response the way Siri, Cortana and Alexa respond to commands. This adds a personalization element and makes the voice UI a brand in itself, benefiting the customer experience. Augmented and virtual reality can bring interfaces into the realm of 3-D, allowing for more interesting and intuitive data control and manipulation. To return to the "Iron Man" movies example, look to how Tony Stark walks around a lab of 3-D projections as he works on an assignment. This gives him the ability to access new displays simply by waving his hand – a detail that would no doubt delight customers. Additionally, 3-D can create location-based experiences. In theory, these would be similar to playing the Pokemon Go app where the types of creatures change based on the player's location. Yet 3-D UI would have even greater crossover with the real world. In this example, perhaps players would mimic the motion of throwing a Pokeball to capture a Pikachu, rather than sliding their finger across a phone screen. In terms of subscription billing, a location-based 3-D interface could provide more accurate pricing, factoring in local taxes or similar requirements. It can also play a role during the sign-up process, automatically identifying factors such as city and zip code so users wouldn't have to manually enter this information. Vindicia, the Subscription People, can help companies understand and implement UI features to boost their subscription management, recurring billing, and customer retention strategies. Our years of experience and wealth of transaction data have allowed us to accumulate best practices not available from any other subscription billing platform.